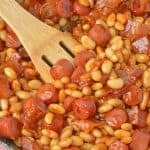 This Franks and Beans recipe is made with real beef hot dogs and less sugar than the canned version. Perfect as a quick and easy lunch or a classic camping food! Heat a large skillet or cast iron pan over medium heat. Add cut hot dogs, stirring until browned. Add great Northern beans, spicy mustard, ketchup, molasses, salt, bacon and brown sugar. Continue to heat and stir until all ingredients have combined and sugar has fully dissolved.